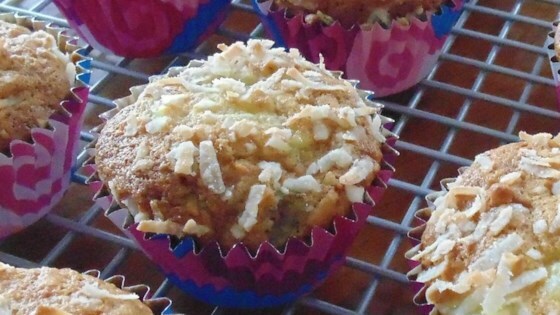 "I took a simple banana muffin recipe and added pineapple, coconut, and rum flavor to made a delectable treat inspired by a popular tropical island drink." Sift flour, baking soda, baking powder, and salt together in a bowl. Stir bananas, sugar, butter, egg, rum-flavored extract, and vanilla extract together in a bowl. Fold flour mixture into banana mixture 1 cup at a time. Add pineapple chunks and 1/2 cup coconut; fold gently into batter. Pour batter into prepared muffin cups and top each with about 1 teaspoon shredded coconut. Bake in the preheated oven until golden brown and a toothpick inserted into the center of a muffin comes out clean, 25 to 30 minutes. Cool for 10 minutes in the pan before removing to a wire rack. Moist and delicious muffins. I used pineapple tidbits instead of chunks, but otherwise followed the recipe exactly. This recipe is a keeper! This is the second time I am making this recipe as written, these are delicious and moist - a nice change from regular banana nut muffins. Another great way to use up those overripe bananas!